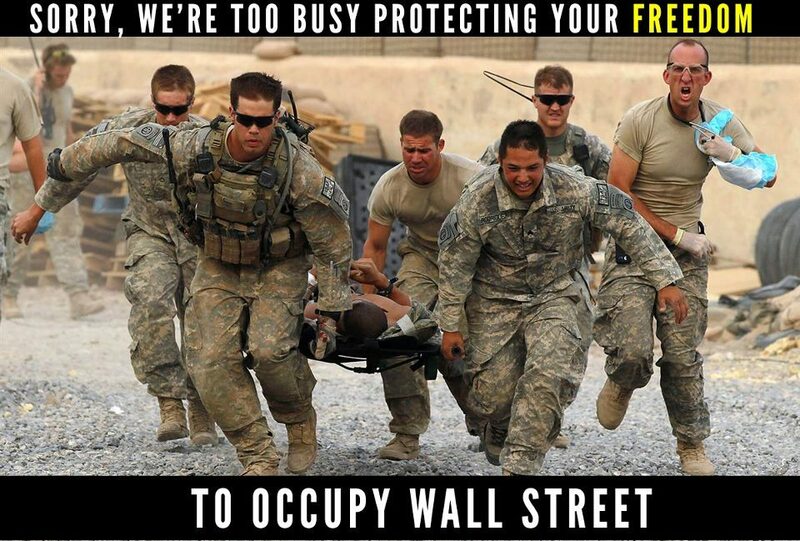 Occupy Wall Street – Sorry! Sooooooo…not sure where the author gets “1 in 3 Vets Sees Iraq, Afghanistan Wars as Wastes”… I didn’t see any numbers in the 30-percentile range as being against the wars…by means of extrapolation, they were all 50% or greater except one number at 45%. If that’s the case…why are you still listening to the chickenhawks Sean Hannity and Bill O’Reilly? Poll after poll after poll consistently finds that soldiers in war zones are not fighting for the bogus reasons put forth by the criminals in Washington, D.C or their shills in the Mainstream Media….they are fighting for their buddy next to them in the foxhole. That being the case, why are flag-wrapped Amerikans still buying the bogus war propaganda disproven long ago? No soldier in Iraq or Afghanistan is fighting for “freedom” in Amerika…contrary to the simplistic, Nationalistic war propaganda reflected in the original picture posted above…they are fighting to get back home to their loved ones. It’s time to bring our boys home from another war for other countries’ natural resources and Wall Street’s bottom line profits…one of the many reasons why OWS is still in the streets while you sit at home and naively support the militaristic oligarchy that rules over us all. And again we find that it takes 1000 words to disprove the lies of war…even the lies surrounding one picture. Well, you can always move, somewhere that doesn’t have a Military, let me know how that works for you after a couple of years, if any of us are still around. But, I trust the guys above in uniform over the hoard of know nothings that occupied wall street, with no particular understanding of why they were even their. Obama and his Union buddies and George Soros sure as hell knew and sure as hell aren’t the answer. The OWS mob needs to understand success is not a civil right. One has to work hard and earn it. What else will they be “protecting” ? Ever heard of Posse Comitatus? Your comment about moving “somewhere that doesn’t have a military” sounds witty to the simple-minded, but in reality, every country has a military…even the Vatican. You naively assume that every country in the world allows its military to run roughshod by invading other sovereign countries that refuse to do business with its corporate owners. Not so…only the arrogant U.S. and its allies exhibit the “might-makes-right” gunboat diplomacy. So, I can’t move to another country that has no military…but, I could move to a country that respects the sovereignty and right of self-determination of others…a country that believes in non-intervention by military force in the affairs of others…and a country that does not speak out of both sides of its collective mouth by contradicting itself depending on which countries grease the greedy palms of its financial, commercial, and political interests. If you really “trust the guys above in uniform over the hoard of know nothings that occupied wall street”, then read the MSM article that I initially referenced…the majority of the “guys…in uniform” believe that Iraq and Afghanistan WERE…NOT…WORTH…IT. Remember Jack…the hero of the Right, George W. Bush, started both of those needless wars in which thousands of “the guys…in uniform” died…but, the Neo-Cons would vote for Georgy boy again tomorrow if they had the chance…because deep down they don’t really give a d*mn about “the guys…in uniform”…and all because they can’t escape the baseless propaganda and empty rhetoric of the Republi-Con shills who have contributed as much to the downfall of the once-great Republic as the Democrats and “Obama and his Union buddies and George Soros” ever did. In the same manner that Wall Street worked hard to create the trillions in fraudulent derivatives like CDO’s (Collateralized Debt Obligations) and MBS’s (Mortgage-Backed Securities) that they sold to U.S. and foreign financial institutions that have infected the economies of the western world like a terminal cancer? Wall Street definitely earned their billions…albeit by massive, historic, and systemic fraud…but, the end justifies the means, right? And you still think that OWS is the problem? Bernie Madoff is just a patsy…a small-time fraudster who bilked investors out of $50-$100 billion. He’s just a red herring to keep the sheep looking in one direction while the really big crooks on Wall Street made their getaway with the assistance of the bought-and-paid-for federal government “regulators”(sic) in D.C.
For example, the Federal Reserve recently backstopped Bank of America’s $75 Trillion in very risky derivatives resulting in the FDIC, aka the U.S. taxpayers, being on the hook conservatively for $10-$14 Trillion when those derivatives go bad…and maybe a lot more. Do the math…the U.S. GDP (Gross Domestic Product) is only $14 Trillion a year…and 224 years of national debt stands at $15 Trillion. Okey, I give up! Prosperity is a civil right. You Mr Brubaker naively think you know who is in charge of everybody elses military, which you obviously don’t. In some cases civilians are in charge of the military in most democracies but not all, in some cases the Military is controlled completely by the government not by the people. In some cases the Military is the government. etc., etc., etc. Few if any have a law called Posse Comitatus, which was purposely formed to limit the power of the military by keeping them from enforcing government will on the people without some dramatic preliminary requirements that the executive, legislative and judicial branches must all agree upon before the military can convene on an extended basis in the business of the people. Now messing with Posse Comitatus in any shape or form as it currently stands is dangerous and must I repeat must be stopped at all costs. So if they are working on this right now I don’t care what Democrats or Republicans say in all their Terriorist Paranoia, no way can Posse Comitatus be inteferred with without immediatly changing this country into a freedom hating country! So everybody better get off their collective asses and call their government reps today, to put a stop to this! Might does make right up until about 1912. Since then this country has been run by mostly wimps, making at least hundreds of thousands of laws and regulations each one taking us closer to socialism every day since 1912. Well folks wake up we are more socialist than a Democrat Republic. The Senate is set to vote on a bill this week that would define the whole of the United States as a “battlefield” and allow the U.S. Military to arrest American citizens in their own back yard without charge or trial. Folks, if thats what the traitors in DC try to tell us is neccessary to defeat the “evil terrs” under every rock, then we have LOST…….the war on terror is nothing but a war on the american people. …. No nation could preserve its freedom in the midst of continual warfare…. The bill was drafted in secret by Senators Carl Levin (D-Mich.) and John McCain (R-Ariz.), before being passed in a closed-door committee meeting without any kind of hearing. The language appears in sections 1031 and 1032 of the NDAA bill. Senator Blutarsky we are in agreement on this one. There is nothing more dangerous than messing with Posse Comitatus at any time. Brubaker is screaming about the power of the military now, if Posse Comitatus is killed with this current Senate Bill, he will really have something to complain about. S1867 is based on pure paranoia of Politicians in charge today and must be stopped at all costs, our Senators must vote this thing down, come on people make the wires sing between you and the Senate today! We are talking the end of freedom as you used to know it! I don’t give two chits who controls anyone else’s military. “In some cases the Military is the government…” Correct…as is the case here in USA. JFK found that out the hard way. As regards who controls everyone else’s military, that is beside the point. Amerika and its allies in NATO are the only countries in the world who are blitzkreiging sovereign countries who refuse to do business with the U.S. Empire and its henchmen. We have steamrolled over Iraq, Afghanistan, and Libya. We continue to invade Pakistan’s sovereignty on a regular basis…and we have Syria and Iran on the Pentagon’s attack calendar. The Neo-Cons in both owned parties can’t wait to add to the million-plus war dead we’ve racked up in the last decade. What other countries in the world are utilizing their militaries to invade other sovereign nations? No one. Therefore, I care not who controls their militaries as long as they aren’t attacking us. I do care that the U.S. Secretary of State Hillary Klinton globe-trots around the world hypocritically prognosticating about peace and human rights while we are militarily-engaged in half a dozen foreign countries racking up more and more civilian corpses…as did her predecessor, Condoleeza Rice, under King George W.
We need to start practicing what we preach for a change. Brubaker, I know you have a Libetarian view on things, and I agree with many things along this line of thinking. But I will never vote for a Prospective Commander in Chief, that will not tell me what act against the US of America, will get him to respond with a request to Congress for a Declaration of War and what temporary Executive Powers he will utilize to control the situation until Congress can respond?? When Paul gives me a specific set of circumstances he will respond to then maybe I will trust him to represent me. I have read a lot of stuff concerning Paul and I do not like what I haven’t heard and I do not like what I have heard concerning Paul in this arena. Also If Nukes are heading to America and in the Air … what will be his response? All important questions that require important short precise answers. It is true that there are dark forces outside of this country that would attack us if the opportunity presented itself. But, we must ask how much of that potential threat is due to blowback after 10 years of very questionable wars that have killed a million-plus foreigners. What red-blooded American male watched Patrick Swayze in the movie, “Red Dawn” and did not imagine himself driving out the foreign invaders who dared to invade our sovereign land and shoot our fellow citizens down like dogs? And yet, Americans arrogantly dismiss that very same sentiment among Iraqis and Afghans and label them as “terrorists”. The sheep herders we don’t shoot down or blow up with explosives, we ship off to Guantanamo Bay for 5-10 years of waterboarding and other creative torture in violation of U.S. and international laws. And we wonder why people want to blow us to kingdom come as if our lives are inherently worth more than theirs? Historians freely criticize Hitler for wanting to create the “Master race”. If he had only known that he could find such a people here in America, he could have saved the world a lot of trouble. Considering that the U.S. spends more on our military than the next 20 countries on the list combined, what country would dare to attack us if not for what they consider to be their perception of self-preservation? For certainly, it would be an act of national suicide on their part. How does the average Russian or Chinese citizen feel about the encroachment of many of the 800 foreign military bases owned by the U.S Military that are right at their doorstep? How much of an outcry would the average American make for preemptive military action if only 10 Russian or Chinese military bases were within striking distance of North America? What we need in the White House is a president who walks softly for a change…rather than like the 800-lb gorilla of late…and carries a big stick in the spirit of Teddy Roosevelt’s famous line. If we end up with any of the chickenhawk Republi-Con candidates like “Nuke” Gingrich, Romney, Cain, or Perry…all of whom are trying to out-testosterone the other, you better pick your smooth stones and sharp sticks now…before they glow in the dark from the radioactivity to come. We’ve been chittin’ in the neighbors’ yards for way too long now…it’s time to come home, dig a latrine in our own backyard, and mind our business for a change. Maybe then we won’t have to keep looking over our shoulder so dang much. “Give peace a chance”…vote Ron Paul. Well Brubaker, you have a powerful argument, but I am not a fan of experimentation. I believe your solution will have us glowing in the dark from radioactivity much sooner, than the other choices. Either way we as a country are in a lot of trouble and I prefer to cut taxes (which also cuts defense capabilities) Not only balance the budget but pay off the debt in 20 years and finally let free entrerprise rehire all the unemployed Americans, return all the power to state and local governments where it belongs and let the FED defend this country from all non-American invaders. Nice Debate have a good life, and hopefully neither one of us will be glowing in the dark after this election. Senator Rand Paul (R-KY) has opposed this piece of legislation as it stands and has proposed amendments — amendments 1062 and 1064– to strike-down verbiage that provides government power against US citizens. Senator Blutarsky If that is what they wind up doing with this law, you are correct.